Hydraulic engineers need to have a thorough and up to date knowledge of the field combined with a broad orientation, to make them a valued partner in the multidisciplinary, or perhaps even more relevant, transdisciplinary sphere of action. Our staff educates BSc and MSc students to have a broad orientation in combination with a technical specialization, to be able to constructively contribute to realistic, adaptive and sustainable design in the field of hydraulic engineering. This goal comprises the three aims of a technical university: the education of engineers on a scientific basis, the execution of research to extend scientific knowledge and the contribution to society in formulating its problems and finding appropriate solutions. The Department of Hydraulic Engineering is very successful in accomplishing this goal, since it is amongst the world’s leading entities in its field. Initiatives for multidisciplinary graduation groups, as well as international collaboration with universities and institutes are strongly supported by our staff. We participating in the Erasmus Mundus Master program “Coastal and Marine Engineering and Management”. 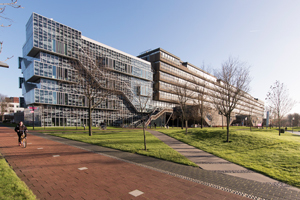 Our MSc and PhD graduates find jobs in government (ministries, waterboards, provinces), non-profit organisations such as Deltares and HR Wallingford, and in consulting companies like Arcadis, Fugro, , Sweco, Royal Haskoning/DHV, Witteveen + Bos and Lievense. Furthermore, many will work at companies such as Shell, BAM, Boskalis, Van Oord, Heerema, Allseas, IHC and the Port of Rotterdam Authority. The relation between these highly respected companies worldwide and our department is fairly intensive. Both parties share interest in having a good, fine-tuned curriculum. A considerable number of MSc-students conduct their MSc Thesis project within one of these organizations. Moreover, employees from the industry regularly give guest lectures or are even contracted by our department to pass on their experience to future engineers.